Image courtesy of ‘Driven’ official Facebook page. Since the announcement of the Kickstarter campaign for the movie Driven, fans of actor Richard Speight, Jr. have been eagerly anticipating the movie’s release. The film’s director, Glenn Payne, and writer/co-star, Casey Dillard, have engaged fans through every step of the movie’s progress via their social media accounts. From the moment filming began in Tupelo, MS, in January 2018 to the film’s world premiere Saturday night in Oxford, MS, Payne and Dillard have made sure that Driven‘s fan base was along for the ride. I knew I wanted to see the movie as soon as it was released. I also knew that Payne and Dillard had previously shown work at the Oxford Film Festival in Oxford, MS, a college town less than an hour away. I began regularly checking the festival’s website in hopes that Driven would be shown. And as luck would have it, Driven was chosen for the 2019 Oxford Film Festival, and I bought my ticket! Lineup of films for the 2019 Oxford Film Festival. Image courtesy of staff writer Em. I arrived at the Malco Cinema theater in Oxford, the location of the Festival, and headed straight to the information booth where I was instructed on where I needed to go and when. I had some spare time, so the ladies at the desk told me I should look around or grab some food. I decided to head to the merchandise table where I bought myself a pair of official Oxford Film Festival socks. (One can never have too many socks.) And then I headed to the concession stand to buy some food while I waited. After a while longer, I saw Payne speaking to several people and walked up and introduced myself. He immediately began looking for Dillard and took me over to introduce me to her. Both were as personable and friendly as their online personas. After speaking with them for a moment, I left them in my normal awkward fashion and went to get in line for the movie. In this Southern Gothic dark comedy, Dinah, a young Mississippi kindergarten teacher, holds her abusive stepfather hostage with the intent to kill him – but only after he accepts Jesus Christ as his Lord and Savior. When I first read that, I was a bit wary of this film. But my fears were completely unfounded. As outlandish as the premise sounds, the short was one of the funniest things I have ever watched. And the twist at the end was a very nice and unexpected touch. 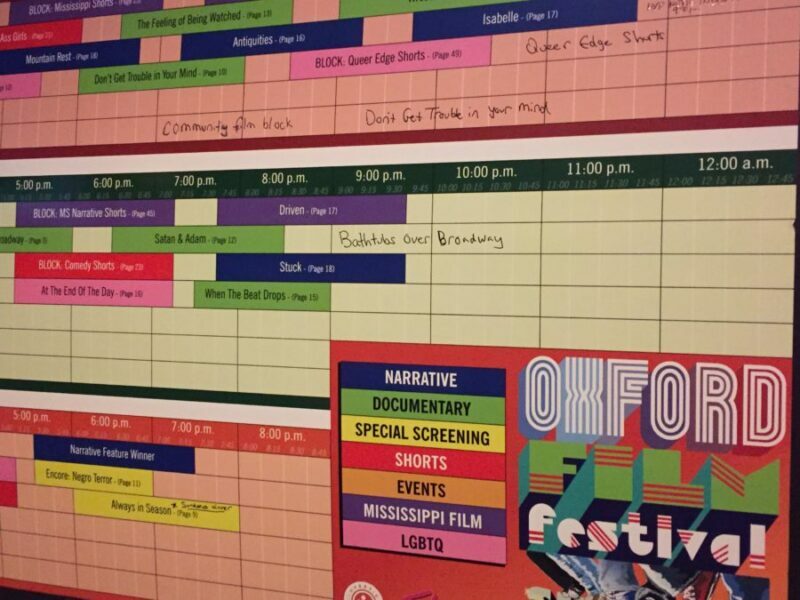 Image taken at Oxford Film Festival, courtesy of staff writer Em. Finally, it was time for Driven, which Dillard described as “Hocus Pocus meets Collateral meets Fallen.” Speight introduced the film via a video clip, speaking of how special the Oxford Film Festival was to him (his own short America 101 premiered there) and his relationship with Payne and Dillard. Emerson Graham’s nights as a cab driver are filled with annoyances and inconveniences, but until tonight, never attacks and disappearances. After picking up a mysterious passenger, her evening goes from working a job to performing a quest as they must race against the clock to defeat a force of evil. The meter is running. Dillard plays Emerson, a woman who spends her nights working as a driver for a rideshare company. On a seemingly uneventful night, Emerson picks up Roger (played by Speight) and is soon wrapped up in the middle of his family business. Being part comedy, there are several gags that had the audience in stitches. Perhaps the funniest was a continued gag involving aromatherapy and Roger’s aversion to it. Oh, and yes — we do finally find out what #turdspoonforever means for anyone who follows along with the movie’s Twitter account. There were a few jumps, although not so much in the super scary sense as it was simply unexpected. Dillard shines as Emerson, and she and Speight played brilliantly off of each other. “Roger” may be my personal favorite role that Speight has ever played. His acting, Dillard’s writing, and Payne’s directing combined to create just the right balance for the film. The film was followed by a short Q&A, where the film’s crew discussed the origin of the film, the hardships of filming in a car, and the freezing cold weather during shooting. Before the Q&A ended, one audience member shared that the film did not seem like an amateur project, and she was right. It was incredible. 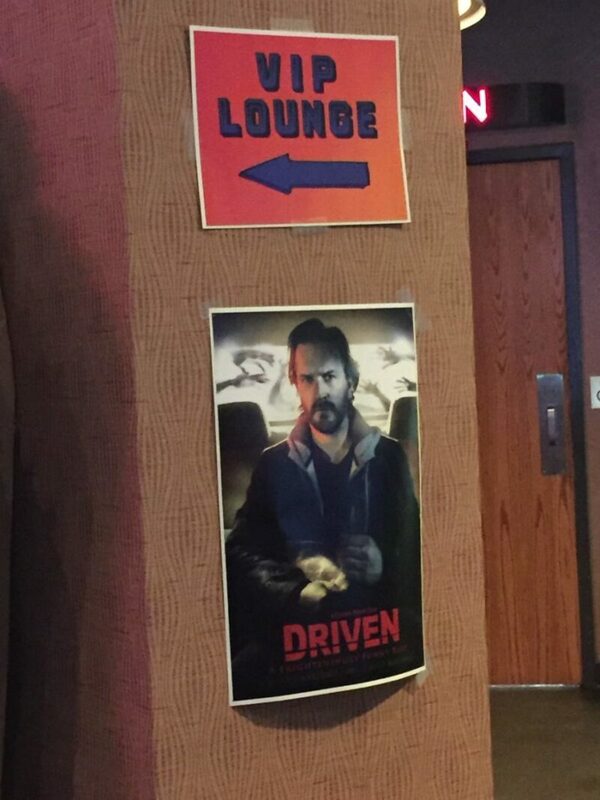 Are you excited to see Driven? Let us know in the comments! Tags: Casey DillarddrivenGlenn PayneOxford Film FestivalRichard Speight Jr. Previous story New “Coco” Show Comes to Walt Disney World at Epcot This Spring!